Our method is so crass that you will find no body using this method. This is no hype or trite and this is no dramatic. This is only truth that I want to share with you to get your trust and confidence. See the FIVE SALIENT qualities of our method. Start SPEAKING FLUENTLY and COMFORTABLY: NeoMethod helps you speak English fluently and comfortably. It turns you into a GREAT COMMUNICATOR effortlessly. Remember, if you are a student of language learning, we take you as a student of Language, not of exam so our method doesn’t teach you tests, exams or the superfluous stuff like that. We directly focus SKILL DEVELOPMENT. We believe that you can learn English by directly focusing the SKILL you want to improve and not by taking a long study of grammar and vocabulary. 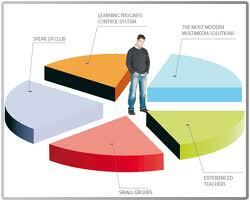 We DO teach GRAMMAR and VOCABULARY but they are geared to the skill that you want to improve. We don't teach grammar for the sake of grammar; rather our grammar and vocabulary lessons help you facilitate the process of learning the skill that you want to develop. DEVELOP YOUR SKILL, NOT GRAMMAR or VOCABULARY: For us language learning is like driving or swimming. When you learn SWIMMING or DRIVING, you don’t start with the mechanism, you simple JUMP or DRIVE and you learn it. It’s just as simple! What’s language? It’s a SKILL and no skill can be learnt without practice. Learning Grammar and Vocabulary is all right, but practice will make you not only perfect but also permanent. Whether you learn ONLINE or ONSITE, philosophy is the same. YOU come first and SPEAK, not the teacher. When you practice in Online Classes LIVE with NEO…You will be amazed how much you learn. Don’t Waste your Efforts, Learn according to your Passion: You learn as much as PASSIONATE you are. You will progress exactly in proportion to your efforts. NeoMethod is not traditional. It’s NEW so we call it NeoMethod. Thus, be 10% Passionate about English and you will learn 10%. Be 50% Passionate about English and You will learn 50% and Be 100% Passionate to Learn English 100%. So you learn as much effort as you put in learn English. NeoMethod FREES your Mind; it gives you autonomy and freedom. Learn English on your own terms. Learning with a Perfect Mentor: Since learning English is all about practice, it doesn’t mean practice without a teacher or coach. If you practice alone and repeat a word 1000 times incorrectly, DO YOU THINK, this kind of practice will make you perfect and permanent? YES, this practice will make your incorrect language perfect and permanent. So to practice correctly and Learn Correct English, you need to practice with a Language Consultant who provides the chance to Practice Language and Corrects you when you make a mistake. FURTHER, if your practice is boring, you will lose your PASSION, so the teacher tries to make your practice as exciting as possible. If Practice is the King of English, Teacher is the King-Maker of Practice. Why NeoMethod is the best Method and Technique? It’s best because it’s scientific and based on Applied Linguistics. Our Coach Naeem himself is a practitioner of Applied Linguistics. Our Method is eclectic which means that it takes the best from James Asher, Stephan Krashen, F.B. Skinner, Lozanov, Charles Curran and many others who researched much in Language Studies and created remarkable findings in their famous works such as TRP, The Power of Reading, The Verbal Behaviour. NethodMethod takes the best from the best and so NeoMethod is the best of the best. These are proven techniques which have helped millions of people across the world in learning LANGUAGE as a SKILL. You STAND as a FAILURE even after studying so much from the classrooms So NeoMethod is crucial. Don’t be SHY, give it a TRY……..Using this new method to learn English in a new exciting way.